St John's Church is part of the Rainbow Parish centred on Kirkby Lonsdale. Pictures of the flower displays May 2014: Theme: Poems of Mirth. This film, a Charlie Shea-Simonds production for the Museum of Army Chaplaincy, was first shown at a packed Hutton Roof Village Hall on 29th January 2010. The evening was presented by Charlie Shea-Simonds and the other members of the production team were also present along with many distinguished visitors and villagers. There will be another chance to see the DVD on Friday March 12th 2010 at St Mary's Church, Kirkby Lonsdale at 7.30pm. A Thanksgiving Service for the life of T.B. Hardy was held at St. John’s Church on Sunday 19th October 2008. 82 people attended the service, coming from all over the country. The address was given by the Reverend P. A. Eagles, C.F., the Assistant Chaplain General. 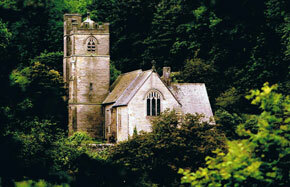 It is thought there has been a church at Hutton Roof as early as the 13th Century. The present church was designed by Paley and Austin and consecrated in 1881. A full report was printed in the Westmorland Gazette and is transcribed here with their kind permission. The church was 125 years old in 2006. On Country Fair and Fell Race Day (Saturday 27th May 2006) a lovely display of the history of the last 125 years was put on. See photos of the displays and the anniversary trip to the Somme. Our Rector, the Rev Canon Graham Bettridge retired in 2006. His last service at Hutton Roof was on 5th March 2006. There is an interesting article on the church in Winter 2005/6 newsletter of the Kirkby Lonsdale & District Civic Society. Rev Theodore Bayley Hardy, VC, DSO, MC. 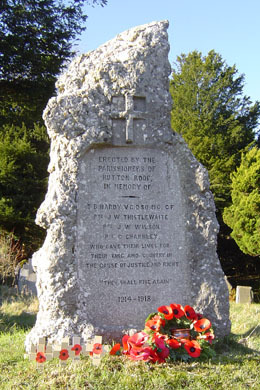 The Rev Theodore Bayley Hardy, VC, DSO, MC, vicar of Hutton Roof from 1913 to 1918 is the most decorated non-combatant in the First World War. 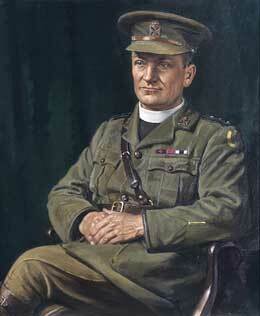 Although in his 50s, the Rev Hardy was determined to join up to serve at the front. It took alot of persistence to persuade the authorities of this, but in 1917 he was with the 8th Lincolns at the Battle of Passchendaele. In September of 1917 he was awarded his first decoration, the Distinguished Service Order and just over a month later in October the Military Cross. For three very brave and selfless actions carried out on the 5th, 25th and 27th of April the Reverend Hardy was awarded the highest honour, the Victoria Cross. When he heard of his VC nomination his reaction was typical of the man, "I really must protest". The Rev Hardy's Victoria Cross was presented by the King, at Frohen-le-Grand on 9th August 9th 1918. On September 17th he was appointed Chaplain to His Majesty. The King hoped that he would be able to prise the Reverend Hardy away from the dangers of the frontline but he refused all offers to leave "the boys".